Our friends Open Ear run a music design agency that have curated soundtracks for use in many different public spaces since 2007, working with a wide range of businesses. They recently commissioned creative content company Inner Ear to produce a video to promote their new ‘Open Ear Player’, an intelligent music playlisting platform with its unique Energy Slider™ control feature. This cleverly designed player and the new technology involved allows businesses to easily take control of their music with a wide selection of simple tools, making music selection both manageable and enjoyable. We created a visual aesthetic that we felt correctly matched their brand identity and mixed three tunes that showcase the service. 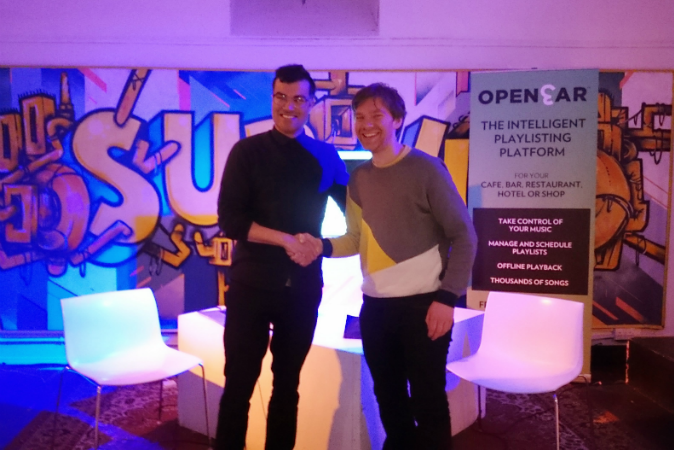 To officially launch the product, Open Ear hosted an evening event at Glasgow’s buzzing SubHub venue, with food, drinks, music and featuring a special Q&A session with Open Ear founder Brian d’Souza. The evening’s talk was compered by Inner Ear Director and SMIA Vice Chair, Dougal Perman. The pair discussed playlisting and music selections in depth as well as talking through the unique functions offered by the new Open Ear Player for use in all sorts of businesses and public spaces. Here you can listen to the full audio recording taken at the Open Ear launch event on Monday 20 April 2015. Inner Ear produces rich promotional content in all formats, for many different kinds of business, products and events. Our Director Dougal Perman has hosted many events, run workshops and seminars, and is a confident and composed public speaker. Get in touch to discuss how we can help promote your project and reach your audiences in a genuine and compelling manner.